Sure, sometimes it’s hot enough to fry an egg on the sidewalk in Phoenix, but why should that mean you can’t have fun when the time is right? 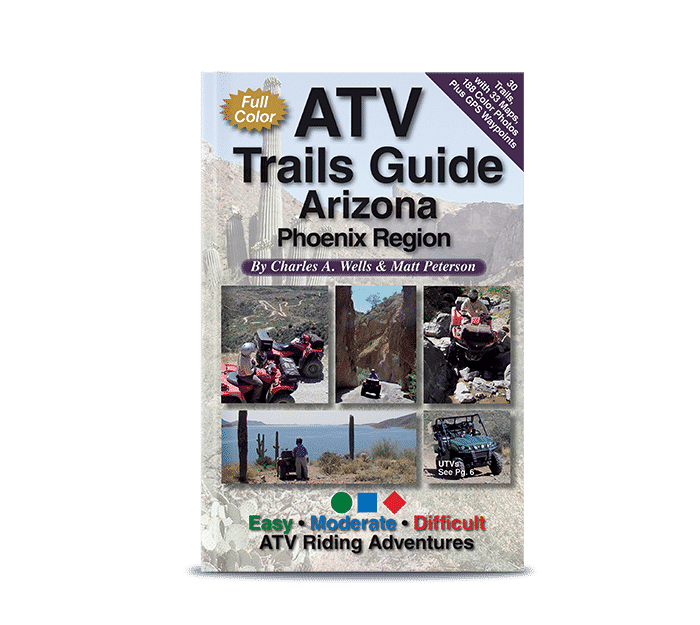 Our Phoenix Area ATV Trail Guide will have you exploring every daytrip option possible in the Phoenix area. That way, when the temperature drops below egg-frying range, you can head out without missing a beat. See all trails in this book. Precise directions, custom maps, and stunning color photos guide you to and through the heart of Arizona’s backcountry. All trails are day trips from Phoenix. Routes for all skill levels. Learn where to unload and the best places to camp. GPS Waypoints are easy to read in mileage log. Great for UTVs and dirt bikes, too. Click here to see a youtube video of Log Corral to Bartlett Lake. Book promotes low-impact riding. I have the book and love it. It has a lot of great information in it. There is a lot of great info and discriptions. You can tell the author spent his time researching. Lucky guy, to ATV all over the place and then get paid for it. If You Ride Motorcycles In The Arizona Desert —- You Need This Book —- Buy The Book —- Buy This book —- You Will Not Be Sorry —- Buy This book —–Buy The Book —- Buy It Now —Worth Every Dime! Once again Wells has done just a great job. I have used his books for Colorado and he is “spot on.” I am heading to Arizona this year and Wells will be by my side. Excellent guide for trails in our area. Excellent guide if your looking for places to explore in AZ. Great turn by turn directions to all of the popular 4×4 trails. Book is great for trails shown. I have seen some places where there are large groups that go into BLM land. Not sure if they should be included. I have bought 3 of these guides. One for myself and 2 as gifts for friends. I have gone on about 6 of the trips. We have a Polaris Ranger (Crew size) and often have 5 people on board. I have found the ratings for the trails to be very accurate. I really don’t want to get in over our heads and I really rely on this book for that. The directions and added information about the areas we travel to is also accurate and interesting. I highly recommend this guide to anyone wanting to do some atv’ing in Arizona. Have fun and be safe. We have a Razor that we take out into the desert in Arizona. This book was very helpful in choosing some new sites to see!